These are the special knives Rick Bütz designed and uses. Shown in his books and television series, these tools are easier to hold, more efficient in cutting and safer to use. 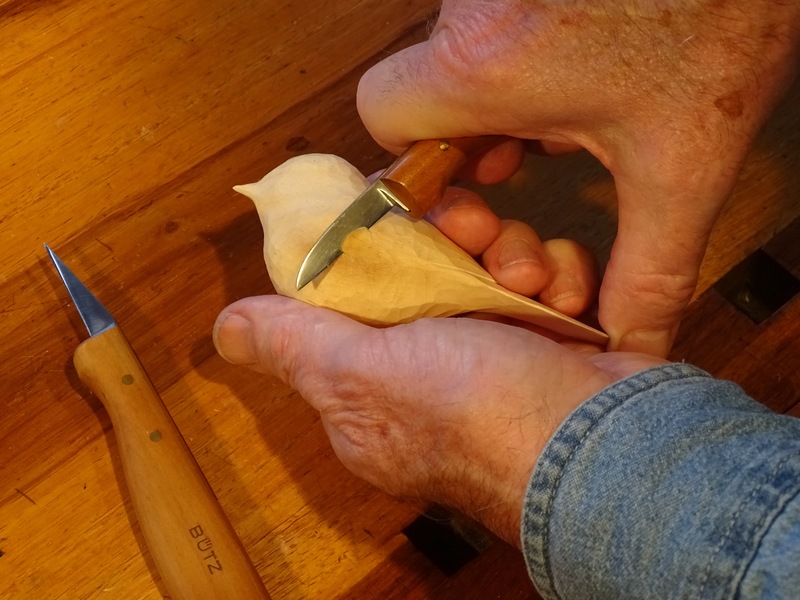 A special forward notch in the cherry wood handles safely puts your hand closer to the blades. You’ll find you have more power and control with this feature. The select cherry handle has also been enlarged and contoured to provide a more natural and comfortable feel. The oil finish protects the knife handle, prevents blisters, and gives greater holding power than regular lacquered finishes. 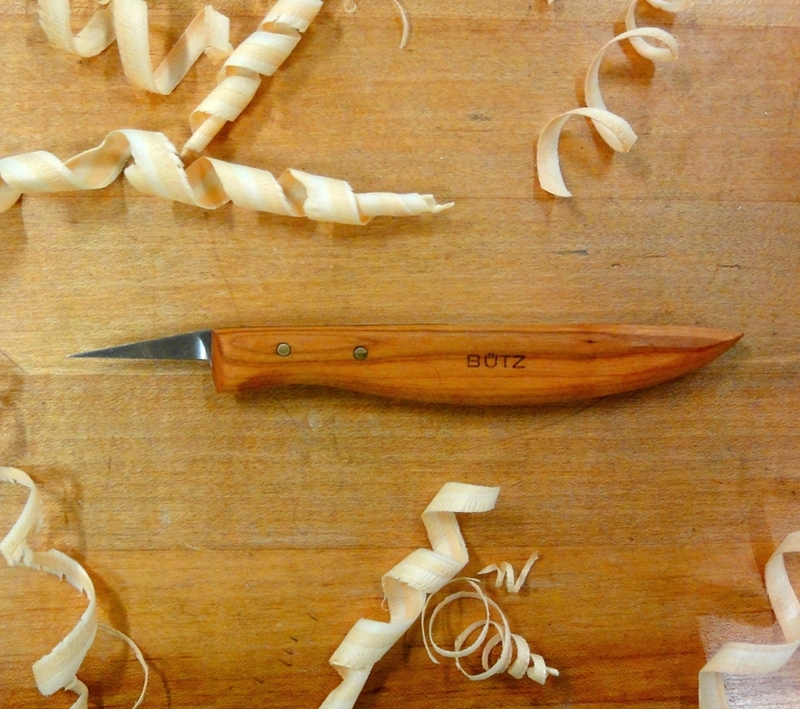 All these features make the Bütz knives the perfect tool for woodcarvers of all skill levels. Requires honing before use. Both knives are made in Germany of the finest Solingen steel. Save over 20% and purchase both as a set. Purchase online. 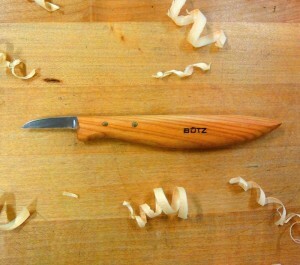 For roughing out, shaping, and general whittling. The sheepsfoot style blade is set deep in the cherry wood handle with a cutting edge that starts right at the handle. 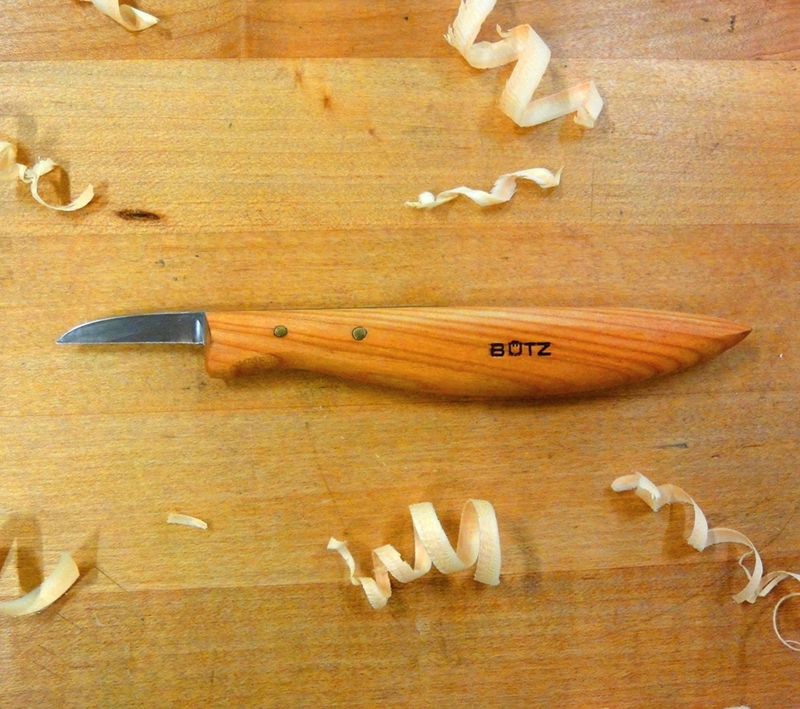 The blade is 1-7/16” long; the handle is 5- ¾” long. Purchase online. The 1-7/16” blade is tapered to create the ultimate tool for those important finishing cuts. The tip is finely ground creating a slight flex, which allows it to fit in areas that are difficult to reach with the standard blade such as detailing overlapping feathers or a figure’s facial details. Purchase online. Exclusively designed and developed by Rick Bütz for the Woodcraft Co., this strop has features that allow quick and easy honing of all carving tools. The large 9½ ” x 3” flat surface provides ample area for putting a razor sharp edge on knives and other straight blade tools. A specially designed, ¼” radius edge fits the inner surface of curved bladed tools, such as gouges and fishtails. The angled, 45-degree edge quickly produces a razor edge of any V-shaped tool. Split leather hide completely wraps the hardwood form, allowing charging of both sides with honing compounds of different grits. Lacquered 4¾” contoured handle fits comfortably in the hand to ensure maximum control. Purchase online. Purchase online.